Yes, Tangled is a musical princess fairy tale, and it's still delightful. Disney is, apparently, scared to death that potential viewers might think Tangled is—may the deity of your choice forbid—a musical fairy tale about a princess. First, there was the change of the title from Rapunzel to the current, less obviously girly alternative. Then there was the message sent to local press in advance of interviews with Tangled’s voice star Mandy Moore suggesting that the film was not 1. a musical; 2. a fairy tale; or 3. about a princess. I mean, sure, last year’s Disney holiday feature The Princess & the Frog underperformed, but you’d think that movie was Jack Abramoff for all the vehement assertions of no thematic connection whatsoever. Here are the facts: Disney movies with princesses, fairy-tale roots and music have made the studio about a kazillion dollars, racked up awards and audience adoration for decades and established a formula that just plain works. At times, Tangled does feel like a greatest-hits medley meticulously constructed from Disney princess successes over the years. And it’s still charming, funny and deliciously entertaining. We all know, of course, that Rapunzel was a longhaired girl who dwelled in a tower, separated from her birth mother until rescued by a prince. Tangled makes more than a few tweaks to the Brothers Grimm version. Here, Rapunzel (Mandy Moore) is a princess who, through complex means, acquired in utero the power once held by a magical plant to stave off death, centered in golden hair that will lose that power if cut. The woman who had benefited from that plant for centuries, Mother Gothel (Donna Murphy), kidnaps Rapunzel and raises her in that tower as her own, away from the world—until the eve of Rapunzel’s 18th birthday, when a thief named Flynn (Chuck’s Zachary Levi) stumbles upon the hidden glade and is convinced to help her venture out for the first time. Screenwriter Dan Fogelman—who worked with co-directors Nathan Greno and Byron Howard on Disney’s Bolt—effectively creates a metaphor for teen rebellion and overprotective parenting, with Moore getting a terrific sequence swinging back and forth between elated freedom and deeply ingrained guilt. There’s nothing particularly ground-breaking about the character—nor about Levi’s ne’er-do-well with a heart of gold—but the filmmakers are savvy enough to provide an emotional hook upon which to hang a familiar Disney format. 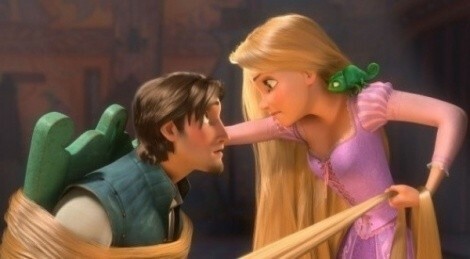 And truly, there’s nothing new under the sunny locks of Tangled. The original songs, by Disney stalwart Alan Menken (The Little Mermaid, Beauty & the Beast) and lyricist Glen Slater, hit the four required elements of every Disney musical: the hero/heroine’s “I want” song (“When Will My Life Begin?”); the villain song (“Mother Knows Best”); the show-stopping production number (“I’ve Got a Dream”); and the love song (“I See the Light”). The comic relief comes in large part from a pair of anthropomorphized animals—a determined Inspector Javert-like horse named Maximus, and Rapunzel’s pet chameleon, Pascal. Even individual sequences feel particularly familiar—the introduction of Flynn to Rapunzel echoing the animated prologue of the recent Enchanted, the romance-in-a-rowboat moment recalling The Little Mermaid and the climax more than faintly duplicating that of Beauty & the Beast. So why is something that sticks so rigidly to familiar—even self-cannibalizing—components still so praiseworthy? Because it simply nails those components. The songs are as Broadway-catchy as anything Disney has crafted in the past decade, with the “I’ve Got a Dream” sequence in particular rendered with hilarious energy. All three central voice performances are terrific, particularly Levi having great fun with the scoundrel role. The comic relief proves genuinely amusing, while the action beats—and there are plenty of them—are terrifically choreographed both for excitement and for laughs. Ever since Disney’s Mermaid renaissance of late 1980s, the studio has demonstrated with few exceptions that it understands how to integrate smart storytelling and family-friendly characters with fun and feeling. It’s a shame that marketing worries appear to have inspired the studio to disavow an approach that has brought—and continues to bring—so much cinematic pleasure. But that doesn’t mean we have to pretend Tangled isn’t what it is. Say it with me now: It’s a musical fairy tale about a princess. When we’re all humming and smiling our way through the happily-ever-afterward of watching, those silly words really shouldn’t matter.